Not all users in Noko are allowed to manage project groups. If you can't, please ask a leader or supervisor to do it for you. You can lump your projects together by a group or client in just a few easy steps! Project groups can help you run reports across multiple projects faster (and making it easier to write just one invoice for each client, even if you have multiple projects for that client!). 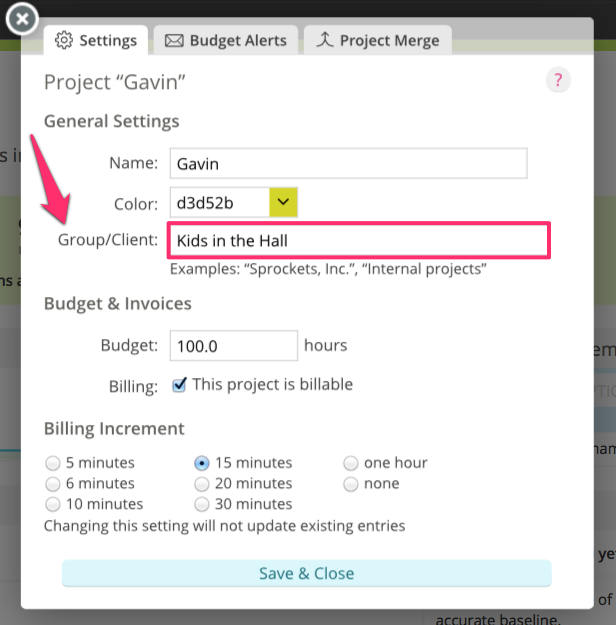 You can also assign a contractor or coworker to all projects in a group with a single click. A project can only belong to one project group at a time. Find the project, hover over it and click settings. Select an existing project group, or enter a new one in the Group/Client field. On the Project Page you can view your projects by group/client by choosing the blue "project group" filter at the top of the page. Mouse over the gray bar with your group/client name to edit, merge, or ungroup the projects in that group. Editing the group/client name will change the group for all of the projects in that group. Merging the group/client is just like merging projects or tags. Mouse over the group/client that you want to merge. Choose the group/client that you want to merge your old group/client with from the drop down menu. 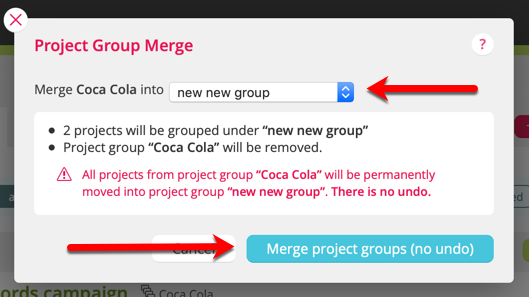 Click the Merge project groups (no undo) button. Be sure to double check the number of projects being merged and the groups/clients that you're merging, because you can't undo this action. Ungrouping will delete your group/client and ungroup all of the projects in that group. Not to worry though! Your projects will stay intact. They will just no longer be assigned to a project group.